Congratulations to Gail Russell and Gerri Mead! Gail and Gerri were married at Lincoln Park Presbyterian Church, Chicago, IL on Saturday, July 26, 2014. It was seventeen years to the day from their covenant ceremony at the same Lincoln Park Presbyterian Church on July 26, 1997. Their pastor at the time was Jeff Doane, and he performed their celebration. This time around, with Jeff and almost 200 friends gathered, Pastor Beth Buckingham-Brown and Evangelist Janie Adams Spahr performed Gail and Gerri’s legal and PC(USA) authorized wedding! What a day and what a time! In many ways, these wonderful friends’ marriage is a love story we share – for one another and for what we have always believed was holy and right and just for our families, our church, and our world. Let no one say that Love makes no difference — for we know better! 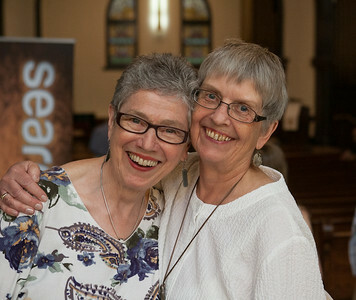 Gail and Gerri are among the pioneers and founders in the early movement of the Presbyterian Church (USA), as were many of those gathered at Lincoln Park Presbyterian Church on Saturday – whether from near or far, in this time and place, or the one that lives beyond. In the following piece that Kent Organ has given permission to be shared, he brings a part of the “love story” to focus in a wonderful and touching way. Please, take a few minutes to read Kent’s message – and prepare to be brought deeply into this moment. And, with Gail and Gerri’s permission, we share many more photos from the ceremony!